He had been battling cancer. ROB FORD, THE controversial former mayor of Toronto, has died aged 46. His family confirmed his death today, saying he had been fighting cancer. He became known internationally in 2013 after Toronto police said they had obtained a video that appeared to show Ford smoking crack cocaine. Ford had remained a councillor after withdrawing from the 2014 race to keep his job in Canada’s largest city. He withdrew after being hospitalised with an abdominal tumour and endorsed his brother, Doug, who would lose out to John Tory. A statement from his office announced the death of the “beloved son, brother, husband and father”. “A dedicated man of the people, Councillor Ford spent his life serving the citizens of Toronto. Swept to the office in 2010 on a platform pledging to “stop the gravy train”, Ford would soon become involved in a number of highly publicised incidents, including being pulled over for reading a document while on a motorway. After months of denials about the content of the video, Ford admitted to smoking crack, but said he was not an addict. After reports of a second video emerged of him smoking crack, he decided to enter rehab. It was reported yesterday that he had been in a palliative care facility. 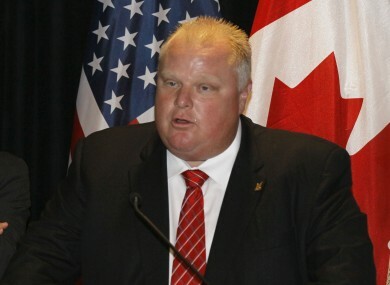 Email “Rob Ford, controversial former Toronto Mayor, dies aged 46”. Feedback on “Rob Ford, controversial former Toronto Mayor, dies aged 46”.